“I woke up among the dead,” said Mo Nazzarin. He had been piled up with hundreds of corpses in a Mosque in Meulaboh in Indonesia in the hours after the tsunami on 26 December 2014. He searched for them, trying to identify relatives among bodies coated in mud. Walking around Meulaboh in those initial hours was like “the end of the world.” Around 40,000 people were killed, a quarter of the town’s population, as the waves crashed in from three sides. Miraculously he found 11 out of 12 close family members alive. Only his daughter of two months had been killed. 10 years later, they live together in a Caritas Switzerland built house just outside the town in a village called Leuhan. Along with homes, Caritas provided the community with clean water, roads and electricity. Things are going well for the family. Ori Fadrizal is one of the children his father threw into the building. He is 19 and is finishing high school. “There was a boy in the water crying for help and I could do nothing to save him”. Fajri Jakfar was at home in Banda Aceh when the tsunami hit. When he heard the screams as people ran from the first wave, he fled on his bike. “A boat flew past me like it was an aeroplane. I left the bike and ran to find a tall house,” he said. With a minute to spare he reached one, climbed onto the second floor and then onto the roof. There were 20 people on second floor and 30 others on roof. A fishing boat crashed into the house, knocking half of it into the water. Another boat just missed them. “All the other houses were gone. We were waiting to be next,” he said. But the house remained standing and the water receded. What remained of the area was an unimaginable scene of devastation. “Dead bodies and debris. Until we die, we cannot forget,” he said. He ended up living in temporary shelter for three months. His family were fishermen, but with all the boats destroyed there were no jobs left. The Caritas Germany-led project allowed the cooperative to build two 40 tonne boats which provide work for 60 people. And the boat that nearly destroyed the house? It ended up lodged on top of another building, where it still is today, a memorial of the tsunami and source of revenue from tourists for the locals. Nobody is quite sure how old Halimah really is. She thinks she might be 113, others say 103. What is for certain is that she has seen a lot of history. When she was a child, Halimah says her coastal village near Meulaboh was little more than forest. She remembers selling biscuits to Dutch settlers during the colonial era. She saw them leave when the Japanese arrived during the Second World War. “They were both the same,” she said. Then there was an eclipse when day become night. And she remembers the 26 December 2004 – the day of the tsunami. “My granddaughter was getting married that day so the rest of the family were making preparations,” she said. 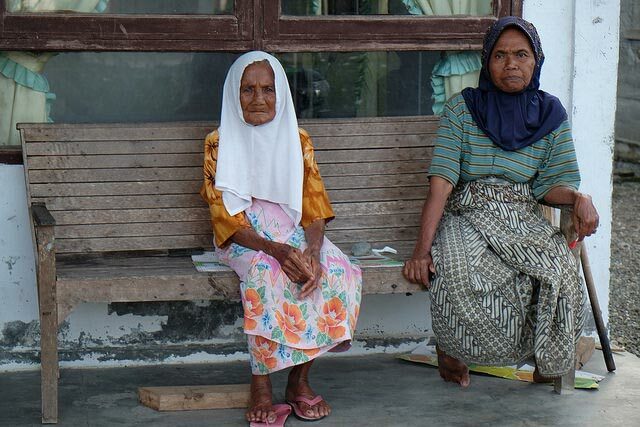 A widow for over two decades, she was alone when the earthquake then tsunami hit. “My neighbours all fled,” she said. “When we heard people crying out about the wave coming, I climbed up a ladder onto the roof.” Much of the house was washed away, but she clung onto the rafters. “Thanks be to God I survived,” she said. The village was completely flattened. At the wedding party, 17 people died. “I have never seeing anything like this in my life,” she said. Halimah has lived in four houses during her life. The one she lives in now, built with the support of the Caritas confederation, she says is the best. “Before they were made out of wood and bamboo. Now it’s made out of concrete. It’s much sturdier and cleaner. I feel safer,” she said. Thankfully 26 December was a Sunday. It was the only day in the week that Nabila Kindergarten was closed. In 2004, the school was made out of wood. When the tsunami came, it was completely washed away. Hilda lived opposite. Her son went there. He was killed in the tsunami, as was her two-month-old baby. Many of the parents of the children at Nabila Kindergarten are traumatised. It’s a neighbourhood school, which is good because it’s close enough for them to visit when the weather is bad or the tide is high.